I have for sale a beautiful fawn girl she is n/At tan/ tricolour carrier, this litter has been very well planned. Both parents come from champion lines. 5 generation KC papers, vet checked, microchipped, first vaccinations. 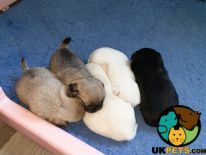 Beautiful KC registered pug puppies. Both parents are health tested. Mum is apricot and dad is fawn. 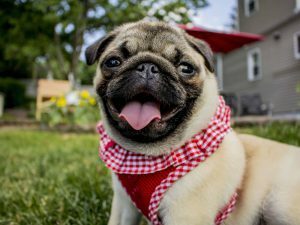 Puppies are being reared in the family with children and other dogs. We have 3 boys and 2 girls. Both parents have been lightly shown. Puppies will go lighter as they get older. 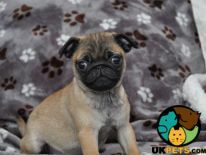 Beautiful platinum girl pug for sale. Had 1st and 2nd vaccinations. Full breed. Seen her mum, sister and brother when we collected. She’s lovely around children and is toilet trained. She’s settled well into routine. Any questions feel free to ask. 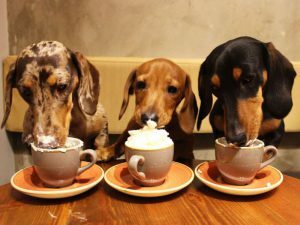 “What could be better than sharing a coffee and pupuccino or a cocktail and a pawtini, with your furry best friend and meeting lots of new friends?” says Anushka Fernando, Pug Café owner and Dachshund Café organiser.